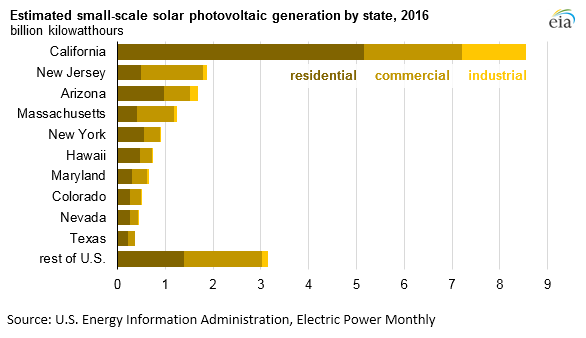 Generation from small-scale photovoltaic (PV) systems totaled about 37% of the annual generation from all U.S. solar PV electricity generators in 2016. EIA’s small-scale category includes PV systems that have less than one megawatt (MW) of generating capacity. Such systems are usually installed at or near residential, commercial, or industrial customer sites. In 2016, the residential sector’s share of total small-scale solar PV generation increased to 52%, based on EIA’s state-level estimates published in its Electric Power Monthly. Residential PV systems, averaging around 5 kilowatts (kW), are typically smaller than commercial PV systems, averaging closer to 200 kW, according to the National Renewable Energy Laboratory. Although EIA does not collect capacity data for individual PV systems, utilities report their customers’ aggregated small-scale PV capacity by sector. Because electric utilities do not necessarily know how much electricity is generated by rooftop PV on their distribution systems, generation from these systems must be estimated. To make comprehensive estimates of monthly generation for all small-scale solar PV at the state level, EIA developed methods that use the data it collects from electric utilities and third-party owners (TPOs) in conjunction with other information. TPOs are energy service providers that own rooftop PV systems located on customer premises and provide electricity directly to customers. 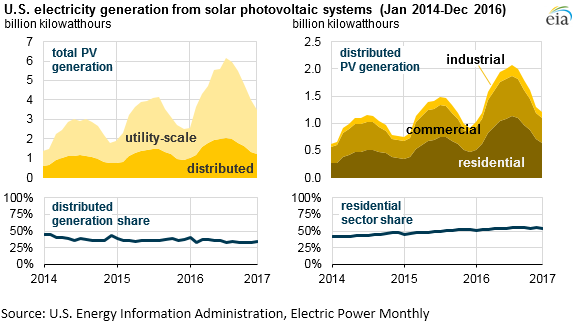 Small-scale PV generation nearly doubled from 2014 to 2016, but its share of total solar PV generation has decreased as utility-scale solar PV generation increased even faster. As more utility-scale solar plants are added, the average size of a utility-scale solar PV plant entering service has also increased, from 10 MW for plants entering service in 2014 to more than 17 MW for plants entering service in 2016. California is by far the leading state for small-scale PV, with 43% of the nation’s total small-scale PV output in 2016. In recent years, New Jersey’s share of the nation’s total small-scale PV generation has dropped most significantly, from 12% in 2014 to 9% in 2016. Unlike other states, where the majority of small-scale PV is in the residential sector, the majority of New Jersey’s is on commercial-sector buildings or sites.